KazSTSAT is a small satellite mission built by Surrey Satellite Technology Ltd (SSTL) for Ghalam LLP (Kazakhstan) under a contract signed in 2013. It will be based on the new SSTL-X50 Earthmapper variant and will carry an SSTL SLIM-6 imager, providing 22 m resolution multispectral imagery with a swath width of more than 600 km for global wide-area imaging. The new SSTL-X50 Earthmapper variant combines a large volume of data storage, enhanced power generation capacity and high downlink availability to continuously image the sunlit land mass making it particularly suited to applications requiring a high temporal revisit rate, such as agricultural and flood monitoring, water quality assessment, forest monitoring and disaster management. Under a joint development programme 14 Kazakh engineers will work alongside SSTL engineers to design and build the KazSTSAT spacecraft. In addition to the SLIM-6 imager, KazSTSAT will fly a number of Ghalam LLP developed payloads, and will join the Disaster Monitoring Constellation, which provides daily images for applications including global disaster monitoring. Environmental testing will take place at a new Ghalam LLP test facility being established in Astana, Kazakhstan. 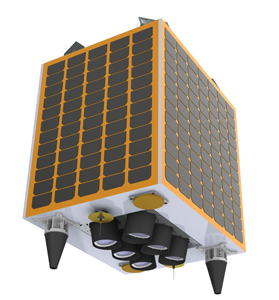 SSTL has developed the new X50 satellite platform to provide a smaller, lighter, flexible spacecraft with enhanced systems capabilities and quality. With a mass of 50 kg, the compact, highly integrated design baselines flight-proven heritage with next-generation avionics to incorporate fully dual redundant subsystems and scaled core platform services such as power, structure, data processing, communications and high-precision attitude control. A launch in early 2017 on a Dnepr was planned, but as Dnepr is no longer available, a new launch provider is needed. The satellite was launched on Spaceflight Industry's SSO-A multi-satellite launch on a Falcon-9 v1.2 (Block 5) rocket.